Spinach ranks among the highest in flavonoids and phytonutrients, which are compounds that have powerful anti-inflammatory properties. Foods with anti-inflammatory properties are highly regarded because of their ability to reduce pain associated with inflammation, and their potential to help prevent serious diseases including many types of cancers. It is high in vitamin C, which helps strengthen the immune system, and also flushes out toxins by acting as a diuretic. This refreshing organic herb is a favorite for teas and mouth care because of its refreshing properties. An animal study published in the Evidence-Based Complementary and Alternative Medicine journal showed that peppermint extract was able to reduce LDL cholesterol levels. Peas are a favorite amongst kids and adults alike, because of their sweet taste. Please try to buy organic ones. They are a healthy source of protein as they are part of the legumes family. Organic garlic is well known and is widely used to treat and prevent colds and flu. A study done in the UK suggests that the participants who took garlic supplements were “less likely to get cold and recovered faster if infected.” Include organic garlic in your diet and you will not need antibiotics. This is a vegetarian recipe with lots of flavors. Peas and fresh mint pair perfectly in this recipe. Prepare this and you will surely thank me later. Boil the kettle and measure out just under 1 liter of boiling water. Add the vegetable stock to the water and stir until it has disintegrated. Chop the onion and garlic and gently fry in a large pan. When browned slightly, add the Arborio rice. Start adding one large spoonful (one at a time) of the vegetable stock. On a medium heat keep stirring until the rice has completely absorbed the liquid. When it has, add another spoonful; repeat until you have no liquid left. This will take quite a while, usually around 25 minutes. When all the liquid has been used, pour in the frozen peas and stir. Add the spinach! 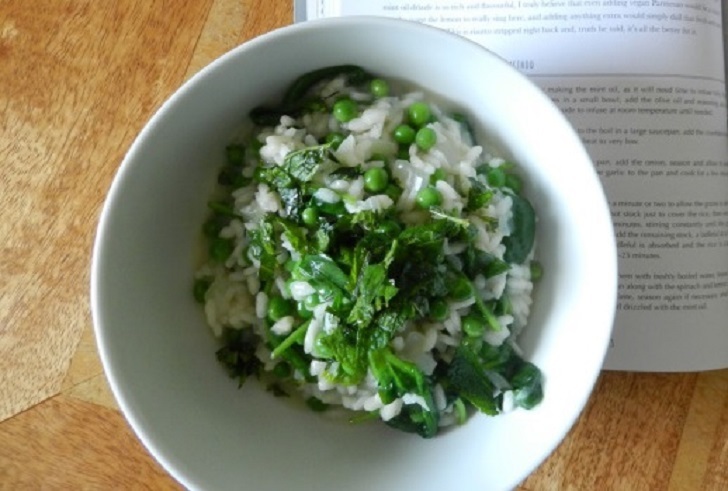 I like to have a lot of spinach in my risotto but it’s really down to personal taste. Pour in the lemon juice. Sprinkle on the mint dressing. Enjoy! If you don’t like garlic you can definitely omit it. I would advise keeping the onion though as it provides a nice bit of flavor. Don't add too much oil and salt to the mint dressing because it’s not particularly healthy. The vegetable stock adds a lot of salt so I wouldn’t recommend adding more.